Does anybody know the names of the unknown? Greg & Robert being my brothers, Dave Newport (no longer with us) was my best mate. Joseph Gregory is my my mum. I was bought up here till I was seven. On reflection I’ve changed my mind, back right is John Smith. Thanks Alan (Percy) My mate Dave bottom left`s ex wife gave me this picture only last week. I don`t know why I was not in the picture. But thanks for identifying the unknowns. 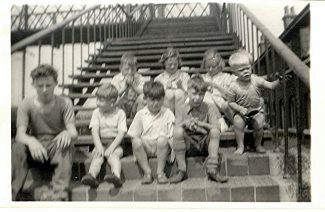 I think that front left is Terry White, back left is me and back right probably is Peter Webb.